This version of the now classic Polyphonic Octave Generator forgoes an octet of fiddly sliders of the original in favour of three simple pots. EHX's Rick Stevenson provides some background: "The Micro POG, just like the original POG and HOG, is digital; it could not be done any other way. The tracking is tighter and quicker than on the original POG although it doesn't have the second octave up, which no one seems to miss, or the detune. On a personal note, I prefer the sound because the tracking is just right." Offering an octave below and above a given note, all three sounds can be balanced with the responsive controls. There's a single input and two outs that allow you to split the dry and wet signals. This is a very musical octaver with almost none of that irritating waggle on lower notes and chords. 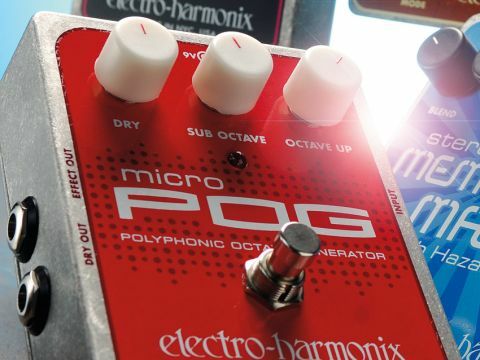 It does take a bit of time to get used to, but the Micro POG can, at different turns, transform your electric into a 12-string, a passable bass or even a church organ. In fact, adding obscene amounts of drive to the latter setting would make Jon Lord quake in his wellies at the helm of his legendary Hammond, while for a speedy sketch demo when your bass isn't to hand, the sub octave with the dry signal removed is more than capable of stepping in. With an electric bass, the POG is a weapon of aural destruction and is great fun to boot. This is a very musical tool indeed, and octave pedals are powerful additions to any pedalboard that shouldn't be viewed as merely niche effects.